Whole Foods may still be seen by shoppers as an alternative to corporate grocery chains, but the highly-profitable corporation just opened its first “365 by Whole Foods” in Los Angeles in an effort to use kiosks and robots to cut 60 percent of staffing costs and maximize profitability. Promoted as a “chain for millennials,” the new “365” stores use about one-third less square footage than the company’s traditional 41,000-square-foot Whole Foods stores, but they also slash almost two-thirds of workers with robots and computerized kiosks. 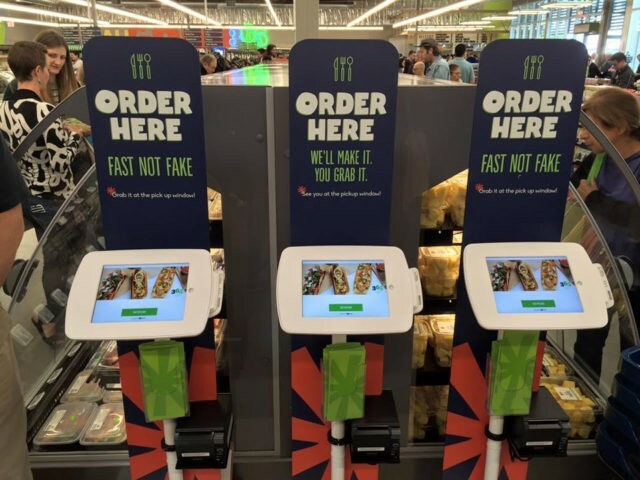 It should not be surprising that the first “automated” WF store is being located in Los Angeles, where state and local governments have passed minimum wage laws that will push wages up by 50 percent in a series of steps to $15 an hour in 2022. Whole Foods founder and CEO John Mackey originally started “Safer Way” in 1978 as a non-profit in Austin, Texas focusing on natural foods. As a naïve 25-year–old with a pony tail, Mackey wanted to offer shoppers an alternative to “evil” profit-seeking corporations. But he quickly found that customers were complaining that his prices were too high, workers complaining that they weren’t being paid enough, and government regulators were smacking him with fees, fines, and taxes. The new “365” stores employ 110 people, versus a normal Whole Foods store staff of 230. Whole Foods company spokeswoman Janette Rizk told NPR that Whole Foods reviewed every opportunity to cut costs by increasing efficiencies, in order to pass savings on to Whole Foods shoppers. She highlighted the self-serve kiosks and electronic shelf labels as giving shoppers more information, while minimizing delays in checking prices and avoiding lines at checkout counters. By unveiling its more modestly priced grocery chain, CEO Mackey said that he wanted to be “the hunter” with the “365” concept, rather than the hunted. That explains why the Whole Foods in-house butchers that usually help customers select special cuts of meat and choose fresh seafood are being replaced at “365” with pre-packaged goods. NPR found that some customers were not thrilled with the new “365.” Although some said the store prices were more competitive, many said they missed the “high touch” service that had become synonymous with the Whole Foods brand experience. Whole Foods will opening over a dozen “365” stores along the West Coast, including in Santa Monica, Claremont, Long Beach and North Hollywood.